I've never entered a recipe contest before, but when I heard about the "Knorr Four" Recipe Contest through BlogHer I thought I'd give it a try. I entered and the next thing I knew a brand new product was delivered to my door. It doesn't hit the grocery store shelves until August, but the Knorr Concentrated Homestyle Chicken Stock has made its way around my kitchen and I love the results! Unlike liquid stock, Knorr Homestyle Stock is really versatile. It can be diluted with almost any liquid, so I diluted it with Corona beer to baste my chicken. I also used it in its concentrated state as a rub for my potatoes. I love the little tubs too, they take up so much less space in my pantry than the big cartons of liquid stock. Here's my original creation. I call it "Four Layer Stocked Potatoes." The husband and kids gobbled these up! They are excellent as leftovers, or they can even be frozen and eaten another day too. Wanna make some? Let's get started. First, preheat your oven to 450 degrees. Wash your potatoes and prick them all over with a fork. Using a pastry brush, cover the entire potato in a thin coating of Knorr Concentrated Homestyle Chicken Stock. The stock is the consistency of jelly, so you may have some clumps, that's ok. You'll use probably about 1 tsp of the stock to coat the potatoes. Next, wrap your potatoes in aluminum foil (shiny side in). Place the potatoes directly on the rack and bake for 40-50 minutes or until the potato is soft when squeezed. If you have a toaster oven, it would work perfectly for this! While the potatoes are baking, let's work on the chicken. Place the two chicken breasts in a zip-lock bag and pound them until they are about 3/4 inch thick. This will decrease your overall cooking time and ensure that the breasts cook evenly. Set them aside. In a small microwave safe bowl whisk 1/2 cup Corona beer with the remainder of the tub of stock. Microwave for 1 minute and whisk to incorporate. Place the chicken on a non-stick skillet that has been sprayed with Pam cooking spray. Using the same pastry brush from earlier, baste both sides of the chicken with your stock and beer mixture generously. Sauté the chicken on medium-high until it is lightly brown on both sides and the thickest part of the meat is no longer pink in the middle. This takes about 8-10 minutes. When the chicken is done, place it in a medium sized mixing bowl and shred with two forks. When the potatoes have finished baking, pull them out and decrease your oven temperature to 350 degrees. Half each potato with a knife and using a melon scooper or a spoon, scoop out the center of the potato, leaving about 1/2 inch of potato around the outside along with the skin. Place each potato half on a baking sheet. Now comes the layering part! The potato closest to us in the picture below shows the beginning of the progression. Layer one: shredded chicken; layer two: 2 Tbsp. salsa; layer three: 1 Tbsp. cheese; and layer four: 1 tsp. bacon. Bake the "Stocked" potatoes for 3-5 minutes in a 350 degree oven or until the cheese is melted. Top with a dollop of sour cream and serve with a side salad. Knorr, thanks for the new product! It's super tasty!! Good morning! Can you please tell me if you were able to submit this entry yet? Each time I try, I receive an error that I'm not authorized to access the page, even though I'm signed in to BlogHer. Thanks! I look forward to trying your recipes along with the Knorr product. I don't know how much that stock costs, but here is an economical (and very yummy!!) alternative I've found to bullion and canned stock: "Better than bullion"
I already ate dinner tonight, but now I want a do-over so I can make these! They look fabulous! Thank you so much for your sweet comment on my freezer meal post! 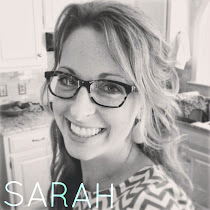 I've been snooping around your blog and I love it! You've definitely got a new follower! Have a fantastic night!